You may remember back at the start of the summer we ran a competition to win tickets to this year’s Farr Festival in Hertfordshire. 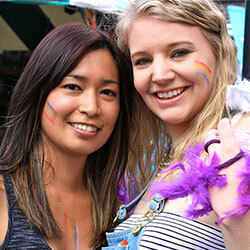 One lucky GaydarGirls member took a mate to the festival for a long weekend of fun, food, drink, music and dancing. Lots of dancing. Some festivals are unlucky to be met with bad weather. But not Farr! The ground was dry, the sun was out and smiles were on faces. We could be boring and describe the festival to you in words. But instead, we’re let you see for yourself just how incredible the weekend was. Girls – if you have not been to Farr yet, or have not been a festival full stop, make Farr your FIRST festival choice. Now I may not have learnt the cockney slang, picked up a posh accent or know how to battle my way through rush hour on the Piccadilly line, but going out in London I’m getting quite good at. Especially since only four months ago I was a country bumpkin finding the tall buildings scary. Rolla Selbak is an award winning filmmaker and self confessed triple-minority in the film-making world – she’s queer, Arab-American and a woman. If that’s not enough, she’s also a self taught auteur writing, directing and producing films that matter.